At the recent FIRST Robotics competition, Ronald Zarrella and Steven Geier were honored as volunteers of the year for their roles as leaders and in supporting the growth of teams in the Northeast. 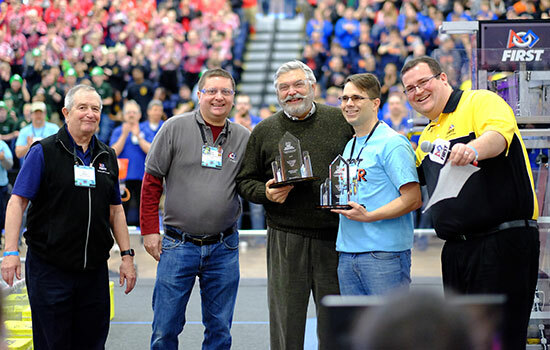 From left, Glen Pearson, Finger Lakes Regional director; Rick Bryant, chairperson, Finger Lakes Regional Planning Committee; Ronald Zarrella, Finger Lakes Regional executive board; Steven Geier, treasurer, Rochester Community Robotics; and Dante DiLella, head referee for the Finger Lakes Regional. Ronald Zarrella, retired Bausch + Lomb chairman and CEO, and Steven Geier, treasurer of Rochester Community Robotics, were honored as Volunteers of the Year for their leadership and contributions to FIRST Robotics programming in the Finger Lakes. Zarrella and Geier were recognized at the recent FIRST Robotics Finger Lakes Regional Competition on March 17 at Rochester Institute of Technology. Both men have made an impact in starting new teams in the region and building the regional competition to become one of the largest and best run events in the area, said Glen Pearson, director of the Finger Lakes Regional. Zarrella, a member of the Finger Lakes Executive Advisory Board and one of the original members of the FIRST Robotics national board of directors until 2012, was instrumental in launching the regional event in Rochester in the 2004-05 season. He and Ursula Burns, former CEO of Xerox and also a member of the national board, saw the potential for an event in Upstate New York and worked to establish a regional event planning committee to acquire funding and lay the groundwork for adding local teams to the competition. As a member of RIT’s Board of Trustees, Zarrella considered the university an ideal spot for a competition and made the request to then-president Albert Simone, who offered use of the Gordon Field House and Activities Center. For the past 14 years, the Finger Lakes Regional has attracted high school robotics teams from across the state, the Northeast and Canada. For the first time this year, the regional hosted teams from China and Brazil. “As someone in the business community, I saw that our country was in need of even more talented engineers, and I wanted to do something to influence that. Interest continues to grow, and many students who participate in FIRST Robotics are more likely to remain in STEM programs in college and then in business, which is very good for our country and the future,” said Zarrella about how he came to be involved with FIRST Robotics. Geier, a business process improvement manager with Paychex, has been involved with FIRST Robotics for the past 10 years. He is mentor for Team SparX, made up of students from Webster Thomas and Schroeder High Schools, and currently serves as treasurer of Rochester Community Robotics (RCR). Geier advises schools about raising funds to launch new robotics teams and helps current teams manage funds to compete at regional events throughout the season. More than 150 volunteers participate in the Finger Lakes Regional each year helping to set up the field, act as judges for individual and team awards, conduct safety inspections and mentor teams as they build robots for the different age levels of competitions: FIRST Robotics Competition, FIRST Tech Challenge, FIRST Lego League and the Jr. FIRST Lego League. 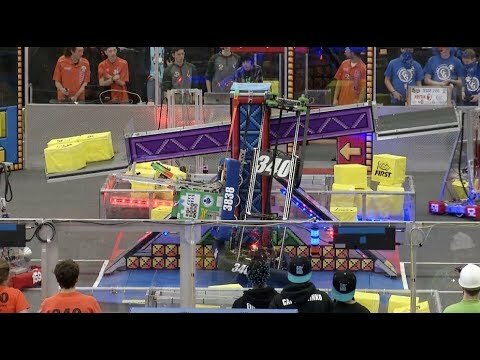 The 2018 FIRST Robotics competition, POWER Up took place March 16-17 with 50 high school teams at RIT’s Gordon Field House and Activities Center. FIRST (For Inspiration and Recognition of Science and Technology), sometimes referred to as a “Sport for the Mind,” began in 1989 to spark interest in science through solving engineering problems in a friendly, yet intense competition. Zarrella spoke to the students assembled during opening ceremonies over the weekend, commenting on how the competition remains intense and the teams display gracious professionalism, one of the hallmarks of FIRST. Although he is retired from Bausch + Lomb, Zarrella had second thoughts about also retiring or easing back on responsibilities with FIRST. “I was thinking of easing up a bit, but then I come to this event. I was talking to some of the students, to young people who are so articulate and enthused about their teams and what they are doing. They were an example of just what FIRST is all about. It had an emotional effect on me. I’m going to stay involved as long as I’m alive,” he said to a standing ovation. Note: Photo gallery available for this story.